Today's tootling over the moors! This afternoon we tootled over to visit our pals Jill and Phil. The hens were having a good scrat about the field. It was a lovely crisp autumnal afternoon. We drove onto Whitby for fish and chips! Back to the diet tomorrow! In for the Night - Try again! The clocks are set to go back tonight - a few minutes ago Jon was chopping up some more logs to store until next year at the earliest. The hens were having their supper of warm rice mixed with their corn. This is log store number 2 - now full. This was the original henhouse which was built 2 years ago. Inside the current henhouse I notice Bev is not laying every day - her eggs are blue, but she lays every other day - really pleased that the cold weather has not stopped them laying - yet!- The hens noticed more logs invading their space! Wouldn't you love to know what they were saying and thinking? Here Mabel and Bev are examining the latest logs! The henhouse is now full of logs - well allowing room for the hens that is! lol! Each night when I lock them safe I notice the sleeping order is the same - margie always sleeps next to the door, then Ernest the cockerel, Mabel (his sweetheart), Olwyn and Eva May and lastly Bev next to the logs,just settling in for the night. They sleep next to the window - all secure and with a deep warm layer of woodshavings. Meanwhile - back at the range the logs piled up for the cold night ahead! Yes, Autumn is here - hence my tootling with my blog - that's what happens when you visit a friend for lunch! Thanks for the inspiration Jill! The few finishing-off jobs to do in the kitchen are out of our hands. We are waiting for the doors for the sink unit, the floor tiles need to be sorted - matched or replaced and a couple more pieces of granite worktop need to be cut and fitted.........so today we started on the lounge! DIY update..The kitchen is awaiting the last few pieces of granite to be cut and the floor tiles to be matched.....we heard our new fire will be in the store this week so we will be working on the hall and lounge very shortly......in the meantime.....the weather forecast seems to be pretty bleak for the future months - winter is going to be cold, very cold and snow is predicted. This doesn't really bother us as we are keen to put the Rayburn through its paces....and hopefully downstairs will be complet by Christmas...watch this space I'll keep you informed. I don't think we'll be going out much on the motorbike as the weather is not biker friendly but somewhere out there the weather will be suitable for a bike adventure and I discovered such the other day. 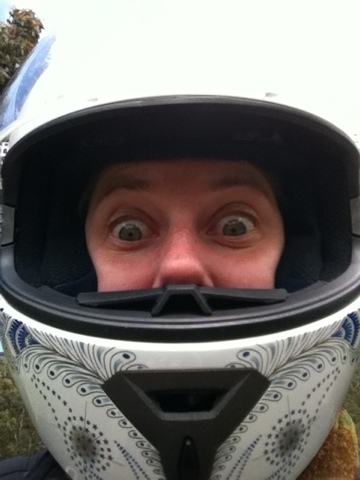 This is the blog of an artist and her new husband (indeed only married a few days ago) on their honeymoon - a bike adventure to Alice Springs. Bridget is an artist and her drawings are fantastic! I will be following their adventure with great interest - I can certainly empathise with them, so why not pay them a visit and follow too! By the look on Bridget's face I am sure we will be in for a fun ride! For more ABC Adventures, visit the link on my sidebar. 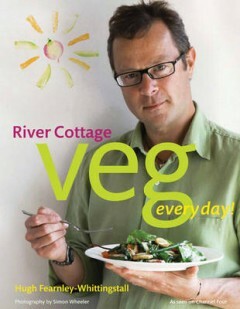 We are huge fans of the River Cottage programmes and the current series is based around Hugh's latest book. I don't eat a great deal of meat, certainly since starting the Slimming World regime I have eaten more beans and pulses so this is an ideal book to use for finding new recipes and ideas. I will be modifying the recipes to cut out frying but I am looking forward to the experiments! Do you have any favourite vegetable recipes? N is for......What's New in the nesbitt household!. No, it is not the latest creature in Dr Who! This was some spare pastry I cooked for the hens - except I forgot it was in the oven and by the time I remembered it was burnt! Yes, as with the Aga, the Rayburn's flu goes straight into the chimney so all smells and fumes are not detectable...some things never change! last week several aired disappointment and no kitchen updates. The only thing to report is our drawer organisers arrived, so Jon fit them on Sunday when we returned from Grosmont railway events. I have tried out a couple of NEW recipes - a strawberry victoria sandwich and a freezer roll. The strawberry recipe is a pretty standard one and the freezer roll is basically mine. I sorted out the freezer and came across some frozen burgers, meatballs and a haggis. I have cooked all 3 and made 3 different types of "rolls". We wont be having and BBQ's until next year so I have used the basic meat mixtures for winter warming snacks. All the meat from the burgers etc is all from our local butchers so I was determined to put it to good use. I have coffee with my neighbours regularly, this afternoon I will take over the above little sample to Rowena, and have a coffee. N is for nesting box - this photo I took only a few minutes ago, of Margie settling down to lay an egg. The girls continue to supply us with fantastic eggs. So a small update on what's going on here. The weather has definitely turned colder and over the next few days it will be all hands on deck to get the garden ready for winter......brrrrrr! For more ABC News, follow the link in my side bar.